With a dinosaur museum, themed garden, farm park, and more, Utah’s Thanksgiving Point brings together multiple experiences on one family-friendly campus. 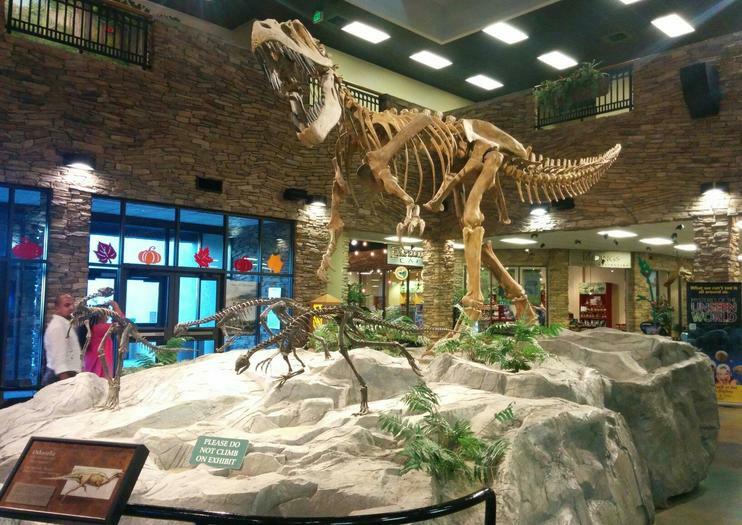 Part museum and part theme park, it’s located 20 minutes south of Salt Lake City and also features a golf course, spa, shopping, restaurants, and 3-D movie theater. Visitors can feed baby goats in Farm Country, wander among the dinosaurs at the Museum of Ancient Life, and explore the natural world through interactive exhibits in the Museum of Natural Curiosity. Thanksgiving Point also features a host of special events and activities such as a spring tulip festival and a fall event featuring a reenactment of the first Thanksgiving at Plymouth Colony. Dinosaur-lovers won’t want to miss one of the world’s largest displays of mounted dinosaurs at the Museum of Ancient Life. A pony ride comes free with your Farm Country admission. You can purchase a Thanksgiving Point Explorer Pass for admission to all main attractions or purchase admission to each attraction separately. The Thanksgiving Point Golf Course is a championship-caliber course. Many of the attractions and gardens are wheelchair and stroller accessible. Thanksgiving Point is located halfway between Salt Lake City and Provo along Interstate 15—take exit 287 and head west to Thanksgiving Way. Ample parking is available. Thanksgiving Point is also easily accessed via the FrontRunner Train from Salt Lake City and Provo. Thanksgiving Point is open six days a week, year-round. The park is closed on Sundays and major holidays, and hours vary by season and attraction. Visit early April through early May for the annual tulip bloom in Ashton Gardens. With more than 280,000 blooming tulips in hundreds of varieties, Thanksgiving Point’s annual Tulip Festival is not to be missed. Fifteen themed gardens display a rainbow of colors, including some historic and rare tulip bulbs. The tulip display is redesigned yearly with bulbs imported from Holland. The festival also features a craft market on weekends, special activities for children, Tulip Festival races, and a photo contest.